This article is about the Model 200 and 300 Series. For the Model 90 and 100 Series, see Beechcraft King Air. "B200" redirects here. For the automobile, see Mercedes-Benz B-Class. The Beechcraft Super King Air family is part of a line of twin-turboprop aircraft produced by Beechcraft. The Model 200 and Model 300 series were originally marketed as the "Super King Air" family, but the "Super" was dropped in 1996. They form the King Air line together with the King Air Model 90 and 100 series. The Model 200 was originally conceived as the Model 101 in 1969, and was a development of the Model 100 King Air. The Model 200 had essentially the same fuselage as the Model 100, with changes to the rear fuselage to accommodate a new T-tail (in place of the 100's conventional tail with all-moving trimmable horizontal stabilizer) and structural changes to allow higher maximum pressurization. Apart from the T-tail, other changes included Pratt & Whitney Canada PT6A-41 engines rated at 850 shp (630 kW) instead of the 680 shp (510 kW) engines of the Model A100 then in production, and a wing of increased span and extra fuel capacity. Overall, the 200 was 3 ft 10 in (1.17 m) longer than the A100, with wingspan 4 ft 3 in (1.29 m) greater, containing 60 US gallons (230 L) more fuel. Maximum Take-Off Weight (MTOW) was increased by 1,000 lb (450 kg). After protracted development including extensive wind tunnel testing of the design (especially of the T-tail which was tunnel-tested for 375 hours), the first prototype flew for the first time on October 27, 1972; a second prototype took to the air on December 15 the same year. Three production aircraft were also built in 1972 and delivered to the U.S. Army; these three were designated Model A100-1s by Beechcraft and were given the military designation RU-21J; the first of some 400 T-tail King Airs to be ordered by the U.S. armed forces. The 200 received civil certification in December 1973 and the first civil delivery took place in February 1974. In 1976, Beechcraft developed the Model 200T, a version configured for aerial surveying or reconnaissance. The prototype was created by modifying a Model 200 aircraft, constructor's number (c/no.) BB-186; the modifications included changes to the belly aft of the wing to allow photography with a vertical camera, provision for a surveillance radar in a pod under the fuselage, dome-shaped windows on the sides of the rear fuselage to allow observation directly below the aircraft by occupants, and a 50-US-gallon (190 L) usable capacity fuel tank on each wingtip to increase the aircraft's range. Customers could specify any combination of these modifications when ordering a 200T; all 200Ts were Model 200s modified at the factory and given new constructor's numbers. The next model to appear was the Model 200C in 1979; this version had a large cargo door on the LH side of the rear fuselage with an airstair door similar to the Model 200's door built into it. The door opening was 4 ft 4 in (1.33 m) high and 4 ft 4 in (1.33 m) wide, allowing a large range of items to be loaded into the cabin. The Model 200C found favour with many operators who fitted them out internally as Air Ambulances. The 200C was built from scratch rather than as a modification of the Model 200. The Model A200C military version was developed concurrently. In 1981, a Model 200C (c/no. BL-24) was modified as the Model 200CT, fitted with the same wingtip fuel tanks as installed on Model 200Ts; there was only one 200CT, but it led to other aircraft after an updated version of the Model 200 entered production. This updated and improved version was the Model B200, which entered production in 1981. It was fitted with PT6A-42 engines, still rated at 850 shp (630 kW), but with improvements that resulted in greater aircraft performance. Other changes included increased maximum pressurization (to 6.5 psi differential) and changes to the cockpit layout. The Model 200C gave way to the Model B200C the same year, with the first Model B200T and Model B200CT being modified from a B200 and B200C respectively, the following year. Commencing in 1984 the B200, B200C and their derivatives were fitted with a revised landing gear retraction mechanism, actuated by hydraulic rams powered by an electric pump installed in the LH wing. This replaced the earlier electro-mechanical retraction system of gearboxes, driveshafts and chains and sprockets that was a throwback to the Twin Bonanza. At the same time the propellers fitted were changed from 3-bladed Hartzells to 3-bladed McCauleys. Forty-seven B200Cs built that year were delivered to the U.S. military, with dozens more of a similar standard ordered in subsequent years, but not given official civil model designations. A total of 14 B200s were produced in 1989 and 1990 in a 13-seat high density configuration with a belly cargo pod; these were marketed by Beechcraft as a commuter airliner under the designation Model 1300. Customers for this version included Mesa Airlines. The propeller installation changed again in 1992, when Beechcraft started offering the option of having 4-bladed Hartzell or McCauley propellers, or 3-bladed Hartzell propellers; the 3-bladed McCauley propellers were no longer available. From October 1995 Beechcraft offered an updated B200 with Electronic Flight Instrument System (EFIS) avionics, this was marketed as the "B200SE Super King Air" (for Special Edition). The following year the "Super" name was dropped from all marketing and advertising. In October 2003, Beechcraft announced another avionics upgrade for the B200, the Rockwell Collins Pro Line 21 suite. The B200 remains in production, with a total of 13 built in 2009. The B200C is available for order; in January 2009 two B200Cs were delivered to the Royal Flying Doctor Service of Australia (RFDS). The two B200Cs were the first examples delivered in about three years (the most recent B200Cs prior to this were two delivered in early 2006 for use as air ambulances in Scotland). On May 21, 2007, during the 7th Annual European Business Aviation Convention & Exhibition in Geneva, Hawker Beechcraft (as the company was now known) introduced the Model B200GT updated version of the B200. The B200GT is fitted with a new model of PT6 engine developed specifically for it by Pratt & Whitney Canada; while still rated at 850 shp (630 kW) the new PT6A-52 develops maximum power to an even higher altitude than the −42 it replaces, thus further improving aircraft performance. The B200GT and B200CGT with large cargo door were certified by the Federal Aviation Administration (FAA) on November 16, 2007 and by the end of 2009, 97 B200GTs had been delivered. Hawker Beechcraft has elected to use new constructor's number prefixes for the B200GT and B200CGT; B200GTs are being built with the prefix "BY" and B200CGTs with the prefix "BZ". In 2014 Beechcraft announced the availability of an option (available at manufacture and for existing aircraft) to increase the MTOW of the B200GT from 12,500 pounds (5,700 kg) to 13,420 pounds (6,090 kg), marketed as the King Air 250EP (for Extra Payload). The upgrade puts the 250EP into the same weight class as the King Air 350, necessitating various system changes to meet certification requirements and a special rating for pilots. Beechcraft considered a jet-powered version in the mid-1970s. The first prototype King Air 200 was re-engined with Pratt & Whitney Canada JT15D turbofans in overwing nacelles. Given the designation PD 290 (for Preliminary Design), the aircraft was flown in this configuration for the first time on March 12, 1975. Beech did not pursue production, and the last flight was made on September 30, 1977. The 200 series proved so popular that Beechcraft began work on a successor, with the Beechcraft designation Model 300 and marketed as the "Super King Air 300". The B200's airframe was "cleaned up" and even more powerful engines (PT6A-60A, rated at 1050 shp) installed in redesigned cowlings (known as "pitot cowlings" due to the reshaped engine air intakes), with MTOW increased to 14,000 lb (6,300 kg). A Model 200 (c/no. BB-343) was modified to develop the updated systems to be used on the new model and flew in this configuration on October 6, 1981. The first flight of the prototype Model 300 took place on September 3, 1983 and deliveries commenced the following year. Because not all nations would then allow an aircraft of this type to be certified at an MTOW greater than 12,500 lb (5,700 kg), the Model 300LW was also developed at the same time, limited to the lower MTOW. Nineteen examples of a special version of the Model 300 were delivered to the FAA in 1987 and 1988. The first two were conversions of standard Model 300s, while the remaining 17 were purpose-built; since they were delivered the FAA has used the fleet to check the extensive network of navaids in the United States. 200 and 300 Series King Airs have been used for similar duties in several other countries, including Australia, Germany, Hong Kong (a B200C used for navaid calibration was the first aircraft to land at the then-new Chek Lap Kok Airport in 1996), Norway, Sweden and Taiwan. On June 13, 2005, Beechcraft announced at the Paris Air Show that it was developing the King Air 350ER version of the B300, an equivalent to the earlier Model 200T and B200Ts of the 200 series. Changes include an increase of MTOW to 16,500 lb (7,430 kg), provision for surveillance equipment in a belly pod, the landing gear of the Beechcraft 1900 to handle the increased weight and provide ground clearance for the belly pod, and extra fuel capacity in the engine nacelles to increase range (because of the B300s winglets, it was unfeasible to fit wingtip fuel tanks as found on the 200T and B200T). On November 11, 2007, Hawker Beechcraft announced that the 350ER had been certified by the FAA. One special Super King Air B300C variant was built for the Swiss Air Force, with a modified belly to allow for aerial photography and a large observation window in the right side aft fuselage; and given a c/no. with a different prefix to other B300Cs. The Hawker Pacific aviation company of Australia purchased eight B300s between 2003 and 2005 for lease to the Royal Australian Air Force (RAAF), which were subsequently modified as navigator trainers. Hawker Pacific later leased another three B300s to the Australian Army, replacing B200 and B200C Model King Airs. 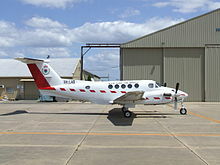 The RAAF has also utilized King Air 350 Special Mission as an interim replacement for the DHC-4 Caribou transports of No. 38 Squadron. The RAAF now operates 16 aircraft from both No. 32 Squadron and No. 38 Squadron. The Japan Ground Self-Defense Force operates nine B300s, designated LR-2, in the reconnaissance and communications roles. The aircraft were delivered between 1998 and 2004 and include the last B300 built without the Pro Line 21 avionics package (c/no. FL-382). The Royal Bahamas Defence Force operates a single B300 on maritime patrol and reconnaissance duties. Beechcraft announced on March 6, 2007 that the Iraqi Air Force had ordered five King Air 350ERs for delivery commencing late in 2007. Hawker Beechcraft exhibited a King Air 350ER at the 2007 Paris Air Show; and at the Royal International Air Tattoo the following month. Photos of the aircraft, which were modified 2005-built B300, showed visual features of the King Air 350ER including a belly pod, and enlarged engine nacelles compared to the nacelles of standard B300 King Airs. The United States Army has contracted for a number of King Air 300s to be acquired on the second-hand market and modified as ISTAR aircraft for use by Task Force ODIN in operational theaters. As of late 2010, 11 such aircraft are registered to the U.S. Army. Two Canadian-registered and owned King Air 300s, configured in the same manner have also been contracted for. Extended range special mission version for surveillance and reconnaissance operations, introduced at the Paris Air Show in June 2005. Features engine nacelle fuel tanks, heavy duty landing gear and increased maximum take-off weight of 7,484 kg (16,500 lb). Typical mission profile involves a 100 n mile (185 km; 115 mile) flight to on-station; low-altitude surveillance sortie for 7 hours 20 minutes; and return to base with 45 minutes' fuel reserve. By early 2010, Hawker Beechcraft was offering structured programme of upgrades for King Air 350ERISR. Accommodation includes two pilots above an armoured floor; sensor operator at console (port, forward facing) providing on-board analysis; club-four seating in centre section with port side table, satellite telephone and refreshment centre; and lavatory at rear. Four King Air 350CERs (Shadow R. Mk 1 in RAF service) equipped for intelligence, surveillance, target acquisition and reconnaissance (ISTAR) missions over Afghanistan were originally were ordered for the RAF and later increased to six in July 2013. 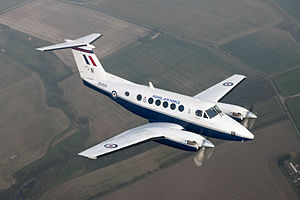 Four more King Air 350s replaced the Royal Navy's Jetstream T2 observer trainers in 2011 and were designated Avenger T. Mk1. On 3 October 2018 the US State Department approved the possible Foreign Military Sale of three King Air 350ERs to the Government of Canada for an estimated cost of $300 million USD. Intended to for a manned airborne ISR (MAISR) role, the Canadian 350ERs are expected to come with customer unique post-modifications for intelligence, surveillance and reconnaissance (ISR) operations. Canada intends to use the aircraft to improve the ability of its Special Operations Forces Command (CANSOFCOM) to meet current and future threats, strengthen its homeland defense and the combined defense of North America and support coalition partners overseas. Numerous aftermarket modifications and upgrades are available for 200 and 300 Series King Airs. One company offers a Wing Front Spar Reinforcement Kit for 200 Series aircraft and a modification to replace the electro-mechanical landing gear retraction system of early-build aircraft with an electro-hydraulic system. Raisbeck Engineering out of Seattle, WA offers Enhanced Performance Leading Edges, Nacelle Wing Lockers, Ram Air Recovery System, Quiet Turbofan Propellers, High Flotation Gear Doors and Dual Aft Body Strakes. The 6,000th King Air was delivered on January 24, 2005. Australia's Royal Flying Doctor Service (RFDS) operates 34 King Air B200/B200C and B300C. Retired military King Airs have entered civil service with United States law enforcement and other government organizations such as State Police and Sheriff Departments; others are used by the Missionary Aviation Fellowship and subsidiary organisations. It was intended to be replaced by the unusually designed Beechcraft Starship but only 53 were produced, ending in 1995, while the King Air continues to sell. More than 1,800 King Air 200 series have been delivered during more than 40 years of production. In early 2017 a used 2011 model King Air 250 was worth US$3 million and a late 2015 to early 2016 model was worth US$5 million, with an annual utilization estimated at 240 hours and 216 cycles, while a King Air 350i is US$800,000 to US$1 million more. By April 2017 sales of the King Air series were in decline with just 12 examples delivered in the first quarter of the year, compared to 26 in the same period of 2016, due to a weak international market for the design. The company expected the annual sales to be about the same as 2016, though, which totaled 106 in that year. Royal Saudi Air Force King Air 350ER. Version of B200 with cargo door, available to order; 112 built as of the end of 2009, of which 47 were built for the United States Air Force as C-12Fs. Later models fitted with Pro Line 21 avionics. A total of 65 other aircraft, similar in specification to the B200C, were built for the U.S. military. Includes new Hartzell composite scimitar propellers and third-party winglets and Ram Air Recovery System; can operate from shorter runways than the B200GT. Two versions, the standard Model 300 with increased MTOW of 14,000 lb (6,300 kg) and the Model 300LW with MTOW limited to 12,500 lb (5,700 kg) to meet the aviation regulatory requirements of various countries; 247 built including 35 Model 300LW and including two Model 300s modified and another 17 built specifically for the FAA for use in navaid calibration. The 300LW has a lower certified Take-Off Gross Weight of 12,500 lb for the European market related to tax. Stretched model with two extra cabin windows each side of forward fuselage and winglets on wingtips; in production as King Air 350i and King Air 350iER. 687 built as of the end of 2009, including 42 extended range versions delivered as 350ERs. Later aircraft fitted with Pro Line 21 avionics. Version of B300 with cargo door; available for order as 350iC and 350iCER. 35 built as of the end of 2009 including one for the Swiss Air Force with modifications for aerial surveillance and five aircraft modified prior to delivery with underwing hardpoints and delivered as 350CERs. Later aircraft fitted with Pro Line 21 avionics. Updated version of B200; current civil production model. A total of 97 are built as of the end of 2009. Updated version of B200C; at least one built in 2016. Operated by Can-West Corporate Air Charters as of 2019. Updated version of B300 with interior upgrade; certified in December 2009. B200 configured as a regional airliner, with room for two crew and 13 passengers, fitted with two overwing emergency exits instead of the standard model's single overwing exit and an optional 455 lb (206 kg) belly cargo pod; a nose baggage compartment provided by relocating avionics from the nose to elsewhere in the aircraft. A total of 14 were built in 1989 and 1990. The most widespread turboprop business aircraft in the world, over 7,300 King Airs and Super King Airs have been delivered by May 2018, surpassing 60 million flight hours in commercial, military and special mission roles. They are operated in more than 94 countries. Almost 53% of the aircraft delivered have been from the 200/300 series family. The King Air is used by many corporate and private users, it is also popular as a light transport liaison aircraft with both government and non-government organizations. It is also used by air-taxi and air charter companies. February 21, 1980: A Model 200 operating as Advance Airlines Flight 4210 crashed adjacent to the runway at Sydney Airport, killing 13 people in the worst civil aviation accident in Australia since 1968. May 24, 1981: A Super King Air 200 of the Ecuadorian Air Force flew into a mountain with the loss of all 9 on board including Jaime Roldós Aguilera, the President of Ecuador. February 17, 1993: a Turkish Air Force Super King Air B200 transporting Eşref Bitlis (the General Commander of the Turkish Gendarmerie) crashed minutes after taking off from the Güvercinlik Army Air Base in Ankara killing all five onboard and one on the ground. September 4, 2000: After departing Perth, Western Australia, the pilot of a Model 200 Super King Air failed to respond to ATC after the aircraft climbed above its assigned altitude. It continued to fly across Australia for five hours before crashing near Burketown in northwestern Queensland, killing all eight on board. Dubbed the "Ghost Flight" by the media, an investigation concluded that the occupants likely became incapacitated due to hypoxia. January 27, 2001: A Super King Air 200 carrying members of the Oklahoma State University Basketball Team crashed in Colorado. December 10, 2001: A Royal Flying Doctor Service King Air crashed near Mount Gambier, South Australia and was destroyed, the pilot sustained fatal injuries and the medical crewmember sustained serious injuries. February 26, 2004: President of the Republic of Macedonia Boris Trajkovski was killed with eight others in the crash near Mostar. The plane was a Beechcraft Model 200 Super King Air (registered Z3-BAB) operated as a transport aircraft of the Government of the Republic of Macedonia. October 24, 2004: A Model 200 Super King Air crashed into mountainous terrain during a missed approach in Virginia. Several members of the Hendrick Motorsports team were on board and died in the crash. December 22, 2015: A B200 King Air crashed at Indira Gandhi International Airport in Delhi, India. All ten occupants were killed; one person on the ground was injured. February 21, 2017: A B200 King Air struck the roof of a shopping center building and crashed just after taking off from Essendon Airport in Melbourne, Australia. All five on board were killed. May 16, 2017: A Japan Ground Self-Defense Force LR-2 (B300S) crashed in Hokkaido near the city of Hokuto. The four crew were all killed. 16'8" × 4'6" × 4'9"
5.08 × 1.37 × 1.45 m 19'6" × 4'6" × 4'9"
^ serial numbers list. technical publications. Beechcraft. ^ a b c d "Raytheon Beechcraft King Air 200." airliners.net., July 30, 2006. ^ Phillips 1992, p. 7-10. ^ a b c d "2016 Business Airplanes Purchase Planning Handbook" (PDF). Business & Commercial Aviation. Aviation Week. May 2016. ^ "Beechcraft turboprop Aircraft". Textron Aviation. ^ "King Air 350ER". Beechcraft. ^ a b c Phillips 1992, p. 70. ^ a b c d e f g h i j k Hawker Beechcraft aircraft Serial Number Lists 1945 to present Archived April 11, 2009, at the Wayback Machine Archived April 11, 2009, at the Wayback Machine retrieved February 1, 2010. ^ a b c d e f g h i j Phillips 1992, p. 65. ^ a b c d Potts, Mike. "The King Air Story (Part 1)". avbuyer.com, May 2004. Retrieved: January 31, 2010. ^ a b Phillips 1992, p. 64. ^ "Raytheon 90/100 King Air." airliners.net. Retrieved: January 31, 2010. ^ a b c d e f g h i Phillips 1992, p. 66. ^ a b c d e Phillips 1992, p. 83. ^ a b Phillips 1992, pp. 84–85. ^ Phillips 1992, p. 91. ^ a b c d e f g h i j k l m n Phillips 1992, p. 84. ^ a b c d e f g h i j FAA Beech 200 and 300 Series Type Certificate retrieved December 11, 2007. ^ a b c "Beech King Air Timeline." Archived December 3, 2010, at the Wayback Machine Archived December 3, 2010, at the Wayback Machine Wings Over Kansas. Retrieved: October 14, 2007. ^ "Royal Flying Doctor Service of Australia 2007/2008 Annual Report." Archived July 22, 2010, at the Wayback Machine Archived July 22, 2010, at the Wayback Machine flyingdoctor.org. Retrieved: January 31, 2010. ^ a b "BL-15". Australian civil aircraft register. Retrieved: January 31, 2010. ^ "UK civil aircraft register." caa.co.uk. Retrieved: January 21, 2009. ^ "Hawker Beechcraft B200C." Archived July 9, 2011, at the Wayback Machine Archived July 9, 2011, at the Wayback Machine Hawker Beechcraft Press Release Retrieved: October 16, 2007. ^ "Model B200GT'." Archived July 9, 2011, at the Wayback Machine Archived July 9, 2011, at the Wayback Machine Hawker Beechcraft Press Release. Retrieved: October 13, 2007. ^ Goyer, Robert (October 24, 2014). "Beechcraft King Air 250 Gets a Lot More Muscle". Flying. Bonnier Corporation. Retrieved May 18, 2017. ^ Martin, Patrick. "Short histories of CAF aircraft types." Martin Slides. Retrieved: October 30, 2007. ^ "Canadian historic civil aircraft register." Archived October 3, 2007, at the Wayback Machine Archived October 3, 2007, at the Wayback Machine tc.gc.ca. Retrieved: October 30, 2007. ^ "King Air B200." Archived December 6, 2010, at the Wayback Machine Archived December 6, 2010, at the Wayback Machine RAF. Retrieved: November 17, 2012. ^ "UltraQuiet active noise canceling system." Archived January 16, 2012, at the Wayback Machine Archived January 16, 2012, at the Wayback Machine Elliott Aviation. Retrieved: January 11, 2012. ^ "Funding Universe." Raytheon History. Retrieved: October 16, 2007. ^ "Turboprop aircraft." LAASdata.com. Retrieved: October 16, 2007. ^ "Canadian civil aircraft register." Archived February 23, 2008, at the Wayback Machine tc.gc.ca. Retrieved: October 16, 2007. ^ "Saudi Arabia air ambulances. "[permanent dead link] Hawker Beechcraft Media Release. Retrieved: December 11, 2007. ^ a b "History". Beechcraft. Archived from the original on March 12, 2017. Retrieved March 9, 2017. ^ Berger, Jacky. "Raytheon Aircraft Company Certifies Heavy-Weight Beechcraft King Air 350." Archived October 17, 2007, at the Wayback Machine Archived October 17, 2007, at the Wayback Machine Wings Over Kansas News. Retrieved: October 14, 2007. ^ "350ER certification. "[permanent dead link] Hawker Beechcraft Media Release. Retrieved: December 11, 2007. ^ "Hawker Beechcraft Corporation Goes Hi-Tech, Hi-Def with New Beechcraft King Air 350i" – Hawker Beechcraft Media Release. Archived July 11, 2011, at the Wayback Machine Archived July 11, 2011, at the Wayback Machine Retrieved: October 24, 2008. ^ Grady, Mary. "King Air 350i Debuts At Sun 'n Fun." avweb.com, April 14, 2010. ^ "King Air 300 Series." LAASdata. Retrieved: October 16, 2007. ^ "Photo database." Airliners.net. Retrieved: October 16, 2007. ^ "King Air." ADF serials. Retrieved: October 25, 2007. ^ accessed via "Japan Ground Self-Defense Force." Archived April 3, 2007, at the Wayback Machine Archived April 3, 2007, at the Wayback Machine JGSDF Order of Battle. Retrieved: October 25, 2007. ^ "King Air 300 Series." LAASdata. Retrieved: October 25, 2007. ^ "Assets." Archived August 24, 2012, at the Wayback Machine Archived August 24, 2012, at the Wayback Machine Royal Bahamas Defence Force Equipment. Retrieved: November 17, 2012. ^ "Iraqi Air Force 350ER. "[permanent dead link] Hawker Beechcraft Press Release. Retrieved: October 14, 2007. ^ "King Air 350ER at the 2007 Paris Air Show. "[permanent dead link] Hawker Beechcraft Press Release. Retrieved: October 16, 2007. ^ "N106R." FAA US civil aircraft register. Retrieved: October 16, 2007. ^ "B300 c/no. FL-424." Airliners.net. Retrieved: October 16, 2007. ^ "Photo of Task Force ODIN King Air 300." airliners.net. Retrieved: November 17, 2012. ^ "Sierra Nevada King Air shows odd mods at static." Archived October 30, 2010, at the Wayback Machine Archived October 30, 2010, at the Wayback Machine ainonline.com, Retrieved: November 17, 2012. ^ U.S. civil aircraft register online searches, using "Beech 300". Archived November 18, 2007, at the Wayback Machine "Archived copy". Archived from the original on November 18, 2007. Retrieved October 24, 2007. CS1 maint: Archived copy as title (link) faa.gov. Retrieved: November 17, 2012. ^ "More on Canada (Maybe) Offering Civilian 'Ear in the Sky' Help in AFG." 'milnewsca. Retrieved: November 17, 2012. ^ "Intelligence, Surveillance & Reconnaissance: New ISR Aircraft Canadian Forces 'CT-145Bs' or Contractor-Operated King Airs?" Archived June 28, 2010, at the Wayback Machine casr.ca. Retrieved: November 17, 2012. ^ a b "Jane's by IHS Markit". janes.ihs.com. Retrieved October 5, 2018. ^ "UK converts King Air 350s into ISTAR platforms." defence-solutions.co.uk, January 13, 2009. Retrieved: February 16, 2009. ^ Hoyle, Craig (July 5, 2013). "RAF to receive sixth Shadow surveillance aircraft". Flightglobal.com. Retrieved October 27, 2015. ^ "Royal Navy unveils its new King Air." key.aero. Retrieved: November 17, 2012. ^ "Canada – King Air 350ER ISR Aircraft (Manned Airborne, Intelligence, Surveillance and Reconnaissance (MAISR) Platform) | The Official Home of the Defense Security Cooperation Agency". www.dsca.mil. Retrieved October 5, 2018. ^ "US approves sale of King Air 350ER aircraft to Canada - Pentagon". Trend.Az. October 5, 2018. Retrieved October 5, 2018. ^ "A list of STCs available for King Air series aircraft." FAA website. Retrieved: November 17, 2012. ^ "Raisbeck King Air Performance Systems." Archived July 15, 2011, at the Wayback Machine Archived July 15, 2011, at the Wayback Machine raisbeck.com. Retrieved: November 17, 2012. ^ "STC No. SA00367SE." FAA. Retrieved: December 11, 2007. ^ "STC No. SA01615SE." FAA. Retrieved: December 11, 2007. ^ "STC No. SA01853LA." FAA Retrieved: December 11, 2007. ^ "Our Fleet". Royal Flying Doctor Service. ^ a b Fred George (February 24, 2017). "Used Aircraft Report: Beech King Air 250". Business & Commercial Aviation. Aviation Week. ^ Grady, Mary (April 25, 2017). "King Air Sales Down". AVweb. Retrieved April 26, 2017. ^ a b Phillips 1992, pp. 83–84. ^ a b Phillips 1992, p. 85. ^ "List of Israeli turboprops." Laasdata. Retrieved: February 6, 2010. ^ "List of Peruvian turboprops." Laasdata. Retrieved: February 6, 2010. ^ "Beechcraft King Air 250." Archived October 25, 2010, at the Wayback Machine Archived October 25, 2010, at the Wayback Machine hawkerbeechcraft.com. Retrieved: November 17, 2012. ^ "Hawker announces new King Air model." bizjournals.com. Retrieved: November 17, 2012. ^ "King Air 250 Gets Hartzell Composite Prop Blades." Archived November 6, 2010, at the Wayback Machine Archived November 6, 2010, at the Wayback Machine ainonline.com. Retrieved: November 17, 2012. ^ "No Rise in Dublin Airport Pax Charges". AviationPros.com. Archived from the original on September 30, 2011. Retrieved October 27, 2015. ^ Phillips 1992, p. 10. ^ a b Phillips 1992, p. 67. ^ "Canadian Civil Aircraft Register". Transport Canada. Retrieved: March 1, 2019. ^ "Beechcraft King Air 350i rolls out improved situational awareness, navigation" (Press release). Textron Aviation. May 30, 2018. ^ "Bangs/Prangs." British Aviation Review (British Aviation Research Group), Volume 29, Issue 9, September 1981, p. S402. ^ Accident description at the Aviation Safety Network. Retrieved on February 21, 2017. ^ "Aviation Safety Investigation Report" (PDF). Australian Transport Safety Bureau. June 2003. ^ "List of Governmental aircraft of the Republic of Macedonia." aeroflight.co. Retrieved: August 14, 2008. ^ "Wreckage of missing SDF aircraft found on Hokkaido mountain". Mainichi Shimbun. May 16, 2017. Archived from the original on May 17, 2017. Retrieved May 16, 2017. ^ "King Air 250 Product Card". Beechcraft. 2016. ^ "King Air 350i Product Card". Beechcraft. 2016. ^ "King Air 350ER Product Card". Beechcraft. 2016. Hoyle, Craig. "World Air Forces Directory". Flight International, Vol. 180, No. 5321, December 13–19, 2011, pp. 26–52. Hoyle, Craig. "World Air Forces Directory". Flight International, Vol. 188, No. 5517, December 8–14, 2015. pp. 26–53. Jackson, Paul. "Beech King Air B200". Jane's All the World's Aircraft 2003–2004. London: Janes Information Group, 2003, pp. 531–532. ISBN 978-0-71062537-3. Phillips, Edward H., Beechcraft: Pursuit of Perfection, A History of Beechcraft Airplanes. Egan, Minnesota: Flying Books, 1992. ISBN 978-0-91113-911-2. Wikimedia Commons has media related to Beechcraft Super King Air. Matt Thurber (January 1, 2013). "Pilot report: Long-legged King Air 350ER is a Flexible and Capable Turboprop". Aviation International News.